I hyped the heck out the oatmeal breakfast my kids would be eating this morning, since they can't have their normal breakfast cereal due to Pesach. (No bread or grains for seven days, according to tradition.) Brown sugar! Butter! Blueberries! Apples! And they were game for it, indeed. My daughter was particularly excited about getting to consume parentally-sanctioned sugar for breakfast. Then I woke up a little later than planned, because Julia and I stayed up late making almond and date truffles for our Pesach spread tonight (but more on them later) and drinking wine. Then I found I didn't have any brown sugar. Then I put too much water into the oatmeal...or something...because I am the bad home cook, remember, and I only just redeemed myself by cooking the hell out of it and hoping to boil off some of the excess water. My kids, hungry and irate already, cast me baleful looks, and I knew I would only be keeping them cooperative if I delivered the goods. 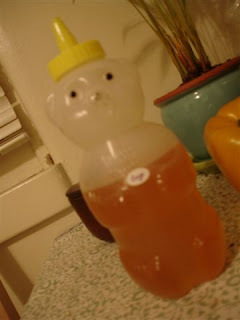 Luckily, I had good local honey from the Farmer's Market. (added bonus: In a bear, which is always more fun than a regular jar), and frozen blueberries. And bananas! And in the end, the kids were happy again. Tonight's the seder. We've got lamb marinating in a hundred spices in the refrigerator as I write this. We have amazing almond and date truffles rolled in coconut that I can't quite believe we actually made. It's gonna be interesting. My only hope is that I get my traditional Passover Cosmo first, to ease me into my long night.